The KORG Pa 300 is the newest keyboard from KORG in the Pa series of bestselling musical arrangers. The Pa 300 is compact, powerful and features the most up to date assortment of high quality sounds and styles. The KORG PA300 delivers an even richer, more detailed, sophisticated natural sound than ever before, with musical instruments from almost every genre brimming with depth, nuance, subtlety, accuracy and richness. Over 950 sounds are preloaded, including a renewed GM soundset, and 64 drum kits. There is also an amazing multilayer stereo acoustic piano, accurately sampled from a Concert Grand, which includes string and damper pedal resonance. Sounds are fully editable and changes can be saved in the User area. The Pa300 has 4 Stereo Master Effect processors, with 125 of these effects including standards such as Reverb, Delay and Chorus and some of the universally acclaimed REMS guitar based effects for authentic guitar tones. 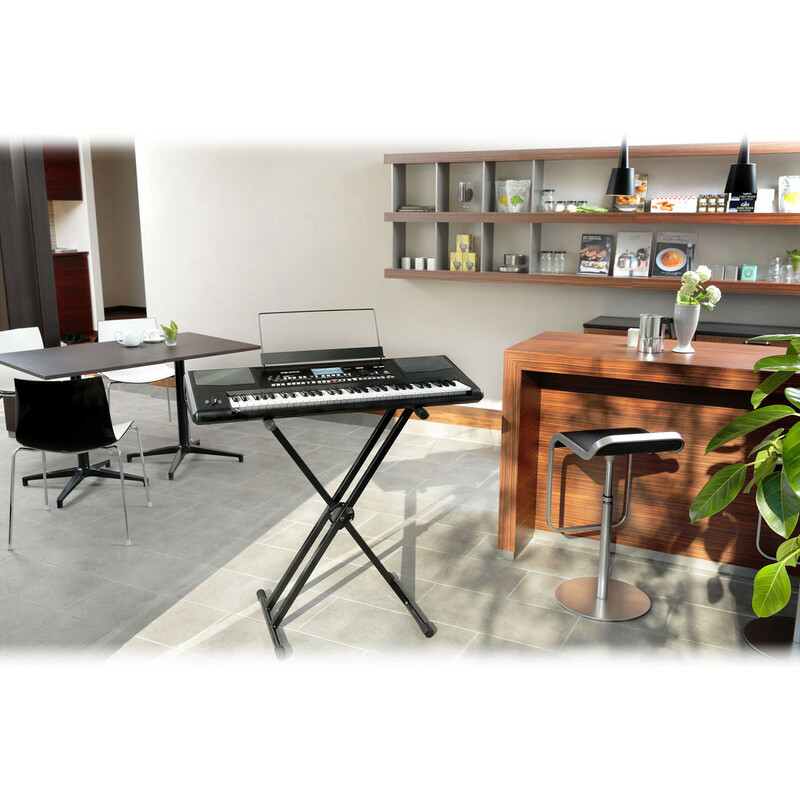 The Pa300 is one of the easiest arrangers to carry around. But while its size might appear diminutive, it?s not the same with regard to the power of the onboard, exceptionally high-quality custom designed amplification system. The 2 x 13 Watt amplifiers drive the 2 loudspeakers in a bass-reflex box to generate a rich, powerful listening experience. The Pa300 onboard player can read MID, KAR and MP3 files. It can also read lyrics and chords from all these file types. Traditional score viewing is also available for those who prefer to read music. The Score Viewer displays the lead track (or any other track) as clear and plain traditional musical notations with notes or chords, together with lyrics and chord abbreviations. The SongBook is a Musical Database, completely user programmable, containing all the settings needed to play a particular song. You have only to search the title of the song you would like to play, select it and press Play. The SongBook can use Styles, MID or MP3 files and immediately recall settings such as Song Title, Genre, Artist, Tempo, Volumes, Sounds, Muted Tracks, FX settings, Easy Edit, Master Transpose and more. Everything you need to play back your song perfectly is in the SongBook. Over 310 factory Styles, each including 3 Intros/Endings, 4 variations and 4 Fill In + Break, plus 8 Favorite and 3 User banks for storage of your favorite Styles. Enhanced Guitar Mode 2 provides even more realistic guitar parts. Improved GM set for Standard MIDI Files, MP3 player with Transpose and Tempo Change, compatibility with popular Lyric formats including graphical (+G), Text Viewer and Score. Fully programmable SongBook database based on Styles, SMF, Karaoke and MP3 files with instant recall of any song setting. User-definable custom lists, plus Filtering and Ordering options.